Under the illustrious leadership & able guidance of Principal Ms. Shilpa Bhatnagar, Bhatnagar International School, Vasant Kunj pioneers the spirit of nourishing rich tradition with a pragmatic & progressive attitude towards the future, fostering academic rigor with an empathetic & compassionate heart. 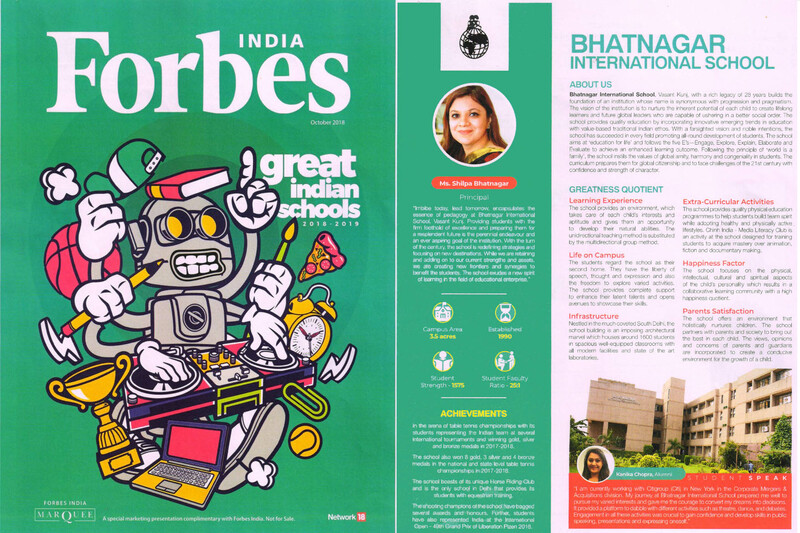 With an unparalleled niche, the school has carved for itself in the teaching - learning community, it found rare coverage in the most coveted and prestigious Indian Edition of FORBES INDIA, November 2018. Please find below the URL link of the soft copy of the edition.